old recipes will continue to load correctly (that is not the case when you save as .DAT format) and new recipes can be added containing values for the new class members. 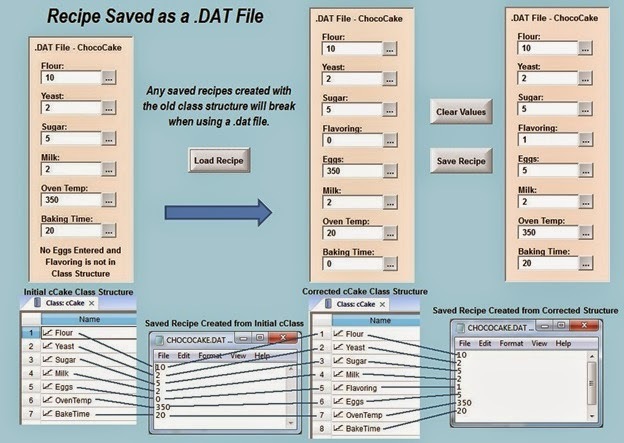 This blog article shows a potential problem with the .DAT recipes in ITME and a way to address it using the XML format.When a recipe is saved as a .DAT file, the format of the recipe is tightly associated with the recipe tags on the recipe worksheet or the class tag member structure that you have defined. For instance, if you created two tags, “ChocoCake” and “VanillaCake” from the generic Cake class called “cCakes” having the members, “Flour”, “Yeast”, “Sugar”, “Milk”, “Eggs”, “OvenTemp”, “BakeTime”; and forgot to add an input field for “Eggs,” and also forgot to enter the class member, “Flavoring,” then saved the recipe, you would have the scenarios shown below. The first recipe for ChocoCake (Figure A) was saved in .DAT format and the recipe broke when the class structure was changed. 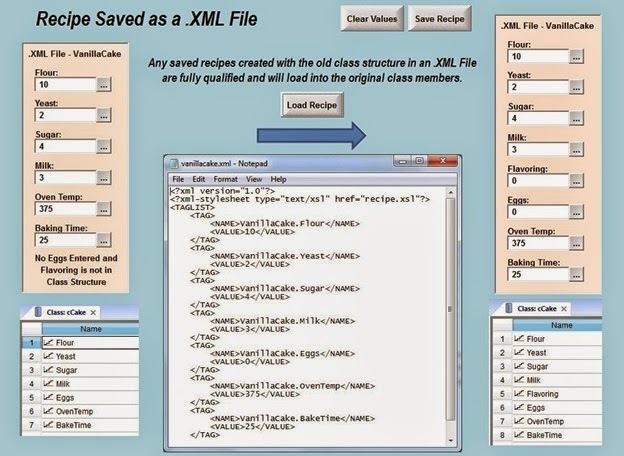 However the second recipe for VanillaCake was saved as an .XML file and each class member is fully qualified (Figure B). Loading this recipe file will continue to populate the correct class members or tags, even though newly added members or tags will contain a default value of “zero”. Therefore, old recipes will continue to load correctly and new recipes can be added containing values for the new class members.